CAS-CIAC is proud to announce our continued partnership with athletic directors and principals in the northeast for the New England Student Leadership Conference. 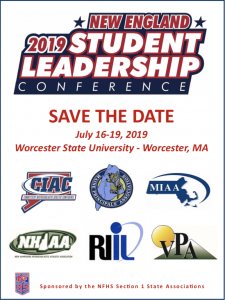 We will be sending a delegation of Connecticut student leaders from athletics, clubs, theater, student council, national honors society and more to the Conference at Worcester State University in July. This 4-day intensive conference is a great opportunity to develop and hone leadership skills, to think about goals and applications for these skills in the upcoming year and to have fun. Applications will be available late-April. Stay tuned for more detailed information! See below for a video highlighting the experiences from last year’s NESLC. Please note: All meals are included in the conference cost beginning with dinner on July 16th. Please contact Cherese Miller (href="cmiller casciac org" target="_blank" rel="noopener">cmiller casciac org) or Anna Flores (aflores casciac org (aflores casciac org) ) at CAS with questions.